I am usually a big proponent of NPR's balanced reporting. But there are so many of us who have feelings about this it seems...awkward and perhaps a touch lazy to let the ANA and one nurse who does safety research speak for all of us. At any rate, we may learn more tomorrow. 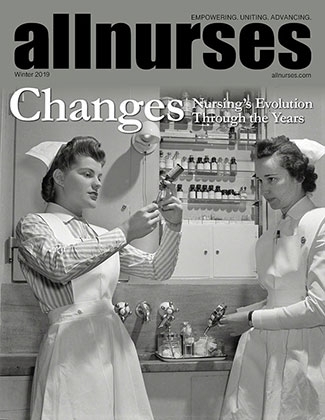 "Suen Ross, the ANA's director of nursing practice and workplace environment, thinks that it's unusual for health care providers to be charged with a crime after a medical mistake that didn't involve malicious intent or intoxication. She calls Vaught's case "unprecedented" because neither of these factors are cited in the CMS report." Suen Ross needs to check her facts. It is not unprecedented. "Manges say that most medical errors occur because of systemic problems. Human error is inevitable, she says, and hospitals should account for that by instituting safety checks and protocols." Which only work if the nurses don't blow by them. I get the feeling that NPR often just interviews someone they met at a party for their features. I think their budget is constrained and 99% of their staff leans pretty far left. I love the 1-A show. That fellow always presents all perspectives! I hope we find out how this came to the attention of CMS and the DA. I don't think anyone planned on CMS becoming involved. I read "anonymous reporting." I am wondering what the TN BON received as a report - they cleared her in October. But CMS? I would assume/hope they investigated when they found out. Did her lack of discipline maybe result from all of the fanfare and publicity that this particular case created? I really don't know and am just thinking out loud. I have read many instances of nurses though who did lose their license to practice even though they too were not impaired, did not exhibit malicious intent, and no patients were harmed while under their care? No, the fanfare happened far after she had been cleared. The TN BON's letter was dated October 2018. In any of the media accounts I've read, there is always a part about "nurses around the country are rushing to her defense". It sounds as though we're all rising up en masse. No mention that a lot of us (maybe the majority) are horrified at such careless practice and cannot support it unless someone gives us a much better reason than we've heard so far. Of course, they're all still touting it as a "medication error". I really don't want the public thinking this is a routine error and that we all think there should be no accountability. Next year when the "most trusted professions" survey comes out, wonder if we'll have dropped a few rungs? I honestly have no opinion thus far on this case. On one hand, I suspect this nurse was overwhelmed and underprepared for the fill-in role she was put into. On the other hand, how do you ignore the words Paralytic Agent on the cap, before inserting a needle? And she had to mix the medication. So presumably, she saw those words several times. Again, I am reserving judgment. The family of the deceased woman appears to harbor no ill will, as they didn't want this nurse prosecuted. But I am sure the emotions of this nurse are all over the place; up, down and all around. Remember the nurse who killed a NICU baby with the wrong dose of Heparin? One person in this case is dead. Two dead won't make it better. I hope she is receiving mental health counseling. In short, NPR is hardly the gold standard of stellar journalism. They are a gilded example of East Coast, Ivy Leagued elitism. Thank God they finally retired the insufferable Diane Rehm. She was a prime example of everything that is wrong with the insular NPR.